Late Wednesday afternoon, the Senate Judiciary Committee passed critical updates to Georgia’s adoption and foster care system, without adding any amendments that would discriminate against LGBT Georgians. The bill sailed through the committee on an 8-2 vote, and could be heard by the full Senate as soon as this Friday. Tackling child welfare is the most important issue before legislators this session. However, in order for the bill to pass, it must be a “clean” bill, meaning there is no discriminatory language included within. Last year, Georgia legislators attempted several times to get an adoption bill through to the Governor’s desk. 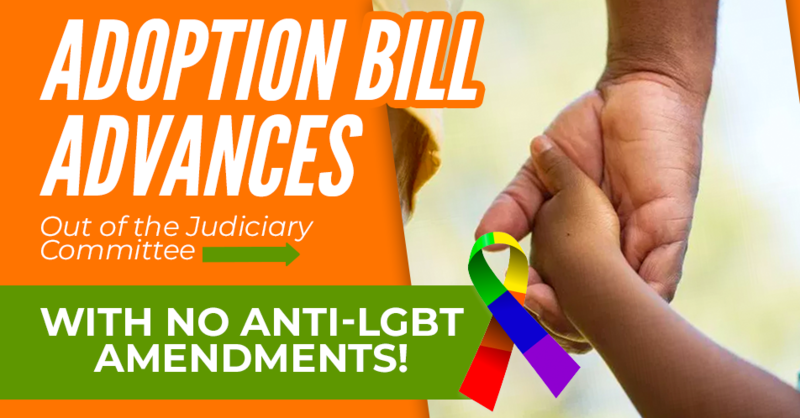 However, the process was held up when some lawmakers placed anti-LGBTQ amendments in the bill that would allow agencies (even those receiving state funding) to discriminate against LGBTQ people when it came to adoption and foster care. In addition to the thousands of Georgians who spoke out and contacted their representatives, leading national child welfare agencies penned a letter to the legislature emphasizing how harmful it would be to “[exclude] any class of potentially qualified parents,” from the pool of loving families, including LGBTQ families. After hearing hours of testimony, and failing to remove the discriminatory language, the adoption bill failed to go to the floor for a vote in the House in the last minutes of the 2017 session. The bill remains active in the State Senate. Now, in 2018, legislators have another chance to pass real, meaningful legislation that will have a positive impact on the 12,000 children in Georgia’s adoption and foster care system. Governor Nathan Deal has pushed for legislators to bring a clean bill to his desk as soon as possible within the new year. Refusal to pass a clean bill could also have an unintended effect on the state’s economy; Georgia is among the many states competing for Amazon’s second world headquarters, known informally as HQ2. As a company, Amazon has stated that they value diversity, inclusion, and fairness, and they want to settle in a location that supports and upholds those values. By attempting to leave or inject anti-LGBTQ language into an adoption bill, Georgia could lose the bid for Amazon, whose initial investment in their eventual location is estimated at around $5 billion. Georgia Unites Against Discrimination urges state legislators to do right by Georgia’s children, and pass a bill that will both modernize the state’s adoption system, and allow all families the opportunity to welcome a child into their home. To contact your legislator and tell them to make adoption a key priority this legislative session, click here.